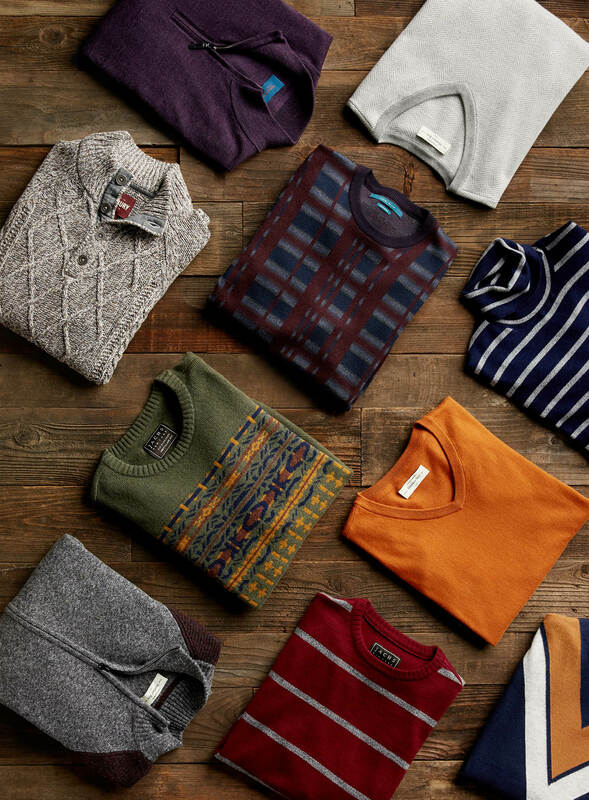 Sweater season is in full swing, and we’re all about it. These do-it-all layers are an investment you’ll wear on repeat, but with so many styles to choose from, finding the right one can be tricky. Luckily, we’re here for you with a handy guide. From crewnecks to v-necks or full-zips to half-zips—we have the lowdown to keep you looking sharp through the holidays and beyond. Keep scrolling to see not-so-ugly sweaters you can wear this holiday. You’ve definitely heard of them and probably have a few in your closet. The crewneck pairs easily with everything, and you’ll find countless options from cotton to cashmere, patterned to cable-knit and more. Falling on the casual side of its v-neck cousin, this style tends to give a boxier silhouette—great for slender guys trying to add a little more heft to their physique. Think crewneck with a little more polish. The “V” in v-neck refers to the shape of the neckline which comes down to a point. It’s an ideal layering piece, especially when worn over a button-up—perfect for the office. Similar to the crewneck, you’ll find no shortage of fabric options, and as an added bonus, the v-shape has a subtle slimming effect. This style has shaken off its stuffy reputation and undergone a contemporary makeover. Few items in your closet can do as much—casual enough for going out, but smart enough for a dressier occasion. The t-neck is modern while still giving off a distinctly retro vibe. Not to mention, the high neck adds extra warmth, so leave your scarf at home. Turtleneck not right for you? Try its sibling, the mock-neck. It still adds structure but with a decidedly more relaxed air. The main difference between the two is the lower fabric height at the neck. The extra breathing room gives you a greater range of movement. You can also find half or full-zip versions that can be worn like a jacket. Maybe you like the idea of a sweater but need a little extra ventilation. These sweaters can be worn like a cardigan or pullover, so they’re great additions to your layering arsenal. Mix it up with a collared shirt and you have an instant office-ready outfit. If you’re looking for something with a little more flexibility, this is the style for you. Ready to up your sweater game? Ask your Stylist to send them in your Fix.